Heaven Hill’s annual Parker’s Heritage Collection limited release is like a box of boozy chocolate… you never know what you’re gonna get. Last year, it was just a lovely selection of ten year old bourbon with that prototypical Elijah Craig profile. Before that, you could find an 11 year old cask strength small batch, a 27 ! year old, a cognac-finished… you get the idea. Box of chocolates. This year, the eighth version of the collection, we get a thirteen year old wheat whiskey. 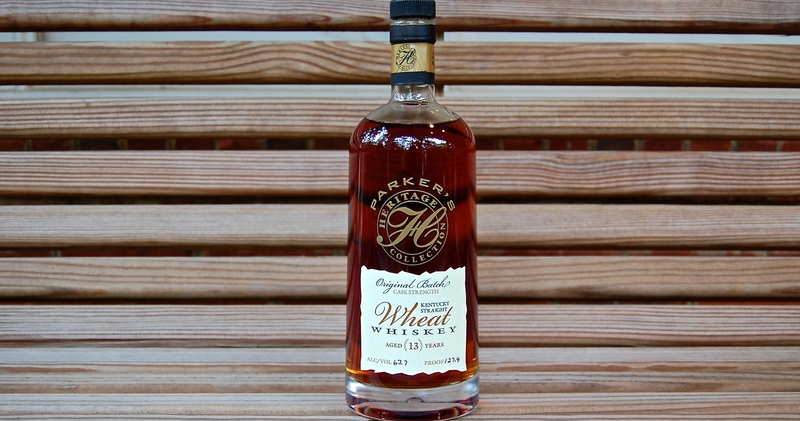 Not a wheated whiskey (a la Pappy Van Winkle or Weller or Larceny, which use wheat in place of rye as a minor contributor behind the dominant corn in the mash bill), but a wheat whiskey (a la Bernheim, which is among the very few American whiskeys that use wheat as the primary ingredient). 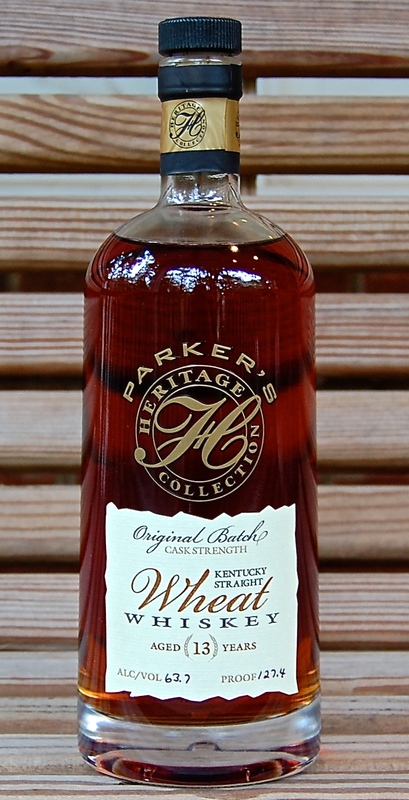 In fact, this Parker’s Heritage Collection release is a whole lot like Bernheim – as it comes from the very first run of the wheat whiskey that would later be bottled as Bernheim (which was first sold in 2005). This limited edition, though, is almost twice as old as regular Bernheim (which just recently added a 7 year old age statement to the bottle), plus comes to us non chill-filtered and cask strength – which is an approach that has served Heaven Hill well with their barrel proof version of Elijah Craig. The mash bill is reportedly 51% soft winter wheat, and there are actually two different batches being sold as part of the release, one at 127 proof, the other TBD. 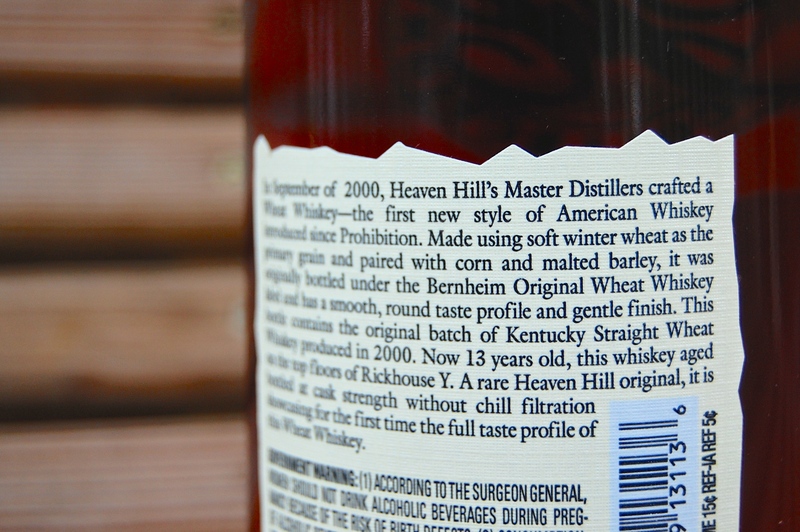 And for you detail-obsessed whiskey geeks, it was aged on the top floors of Heaven Hill’s Rickhouse Y in Bardstown. On to the notes. The color? Deep amber, surely due to those years at the upper reaches of rickhouse Y (the higher up, the higher the temperature swings, and the more interaction the bourbon gets with the wood). The nose? Toasty oak is quite prominent, in a very nice way. There’s a good jolt of Bit-O-Honey, with dark caramel and vanilla also coming on pretty strong. I also get a plum and dark berry fruitiness to it, that leads into hints of an oaky cabernet, even some Chateauneuf de Pape. Intriguing stuff. A touch of water softens the sweetness and amps up the warm oak, plus brings out a background buzz of herbal spiciness that seems almost rye-like (crazy, I wouldn’t expect it from wheat, but there it is). Neat… as expected… this is really strong, but in a pleasing way. Tingly and soft at once, with a long cinnamon spice finish. The high proof works, and you can slowly sip this without fear. But a bit of water brings out the sweet depths in this whiskey and accentuates the nice balance between the many elements at play, with enough dark caramel and honey to please any bourbon fan for sure. The time in the barrel has rendered this far richer than many may expect from a wheat whiskey (regular Bernheim is known for being on the lighter side). Even better than adding a touch of water, a single ice cube works some magic here as it slowly cools and dissolves into the whiskey. The texture becomes thicker, lightly syrupy even, and the whiskey performs a tremendous tightrope walk of wood and spice and sweetness and grain and heat. I just want to chew and chew on it, and the long slow finish keeps you coming back for more. It gets more delicate, lightly floral, smoother and even chewier as the ice seeps into it, never reaching the point of being too watery. And as the ice settles in, it skirts into a more Scotch-like territory, with prominent grain notes coming forward (as in a lighter, more floral and fruity Scotch, nothing smoky or peaty here). The cooled down finish carries mellow and warm grain plus tinges of cinnamon red hots at the end. After enjoying the glass with an ice cube, I go back to a neat sip and that Bit-O-Honey pops out strong again. The range of expression here is crazy and fascinating. This is a drink well worthy of exploration. There’s a good chance my love of this will be an outlier vs. others’ opinions. 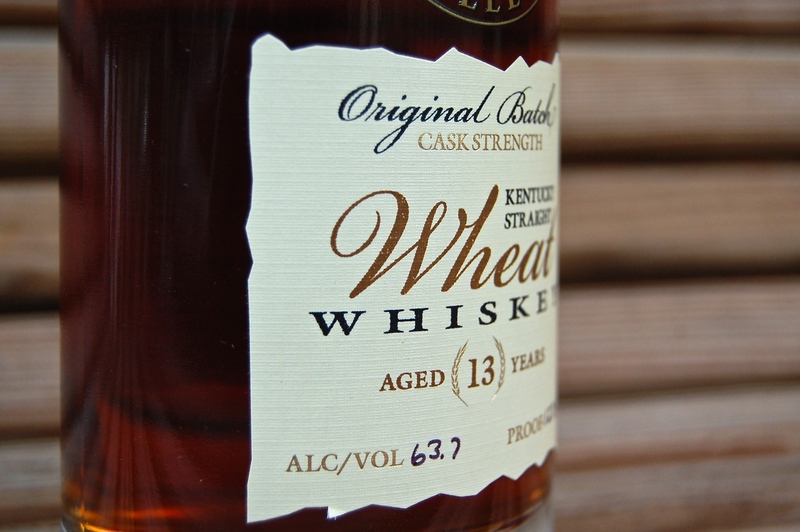 Is a thirteen year old barrel proof wheat whiskey going to be everyone’s cup of tea? No. Actually, I doubt anyone out there has ever tasted a thirteen year old barrel proof wheat whiskey. But this is remarkable and interesting stuff for any whiskey fan. And entirely unique. The extra age and the extra proof give this wheat whiskey an intriguing combination of wood and grain. Parker’s Heritage Collection has turned out a real winner here – something different, something stellar. Highly recommended if you can find a bottle, and the $90 recommended price is not bad at all for whiskey of this caliber. Just picked up (2) bottles today in my local store. Was lucky in that they just put them on the shelve 2 hours before I walked in.